To get a better understanding of the monarch butterfly's future, Jack Boyle built a time machine. Boyle, a Mellon Postdoctoral Fellow of Environmental Science and Policy at William & Mary, has been using the web to mine millions of century-old botany records to track abundance patterns of milkweed in America. Contrary to claims made by scientists and activists for decades, he's learned that genetically modified crops are not the main culprit for the decline of milkweed, the principal host plant for monarchs. "We're attacking, in a very mild way, the received wisdom that the big thing we need to worry about with monarchs is genetically modified crops, that all this spraying of herbicide has devastated the milkweeds," Boyle said. "Of course, we can't rule out that that's been what's happening in the past 20 or so years, but that's only the tail end of milkweed decline. They've been dying off since the middle of the 20th century, long before genetically modified crops." Boyle is the lead author on a paper detailing his findings, which was recently published in the journal PNAS. 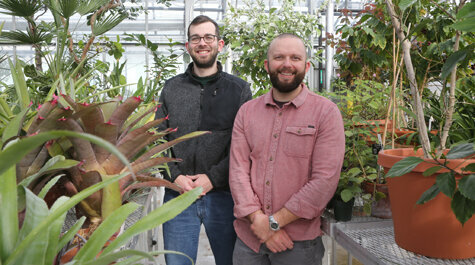 His co-authors are Assistant Professor of Biology Josh Puzey and Associate Professor of Biology Harmony Dalgleish. Common milkweed—or Asclepias syriaca—is best known for its relationship with the monarch. The plant serves as the insect's primary breeding habitat. The butterflies lay eggs on milkweed, they hatch on milkweed, eat milkweed leaves and spend the next two stages of their lives on milkweed. Historically, milkweed has made its home in corn and soy fields, growing just between the rows or on the edges of farmland. The conventional wisdom for the past two decades has been that the largest contributor to the loss of milkweed in America was the advent of genetically modified organisms (or GMOs) that were designed to resist herbicides, Boyle said. "The butterfly's dramatic decline has been driven in large part by the widespread planting of genetically engineered crops," read a 2017 report by the Center for Biological Diversity. "The dramatic surge in the use of Roundup and other herbicides ... has virtually wiped out milkweed plants in the Midwest's corn and soybean fields." Boyle says the decline in family farms in favor of industrial agriculture has made more of an impact on the habitat for milkweed. The timing of monarch and milkweed declines roughly correspond to the mid-century agricultural revolution, the paper states, which led to increased mechanization and chemical inputs to farmland. Since then, the United States has seen rapid growth in average farm size, accompanied by an equally rapid decline in the number of farms. Since 1900, the number of American farms has fallen by 63 percent, while the average farm size has risen 67 percent, according to the USDA. Still, the team's findings indicate there are a lot of unknowns. 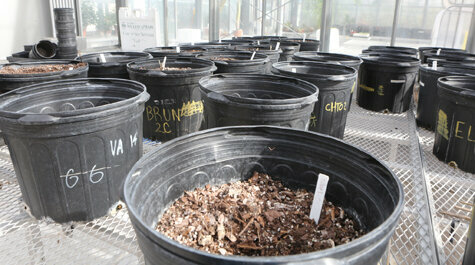 "We tested the role of farm size, herbicide use and fertilizer use," Puzey said. "Collectively, the model explained less than 20 percent of the variation in milkweed abundance. In other words, there's a lot of variation in milkweed abundance that's not explained by farm size, herbicide use or fertilizer use." The team extracted digitized collection information for 1,191 specimens of monarchs and 39,510 specimens of milkweed, collected over a 116-year period. The researchers knew that taxonomists would vary in their collection efforts over that period, so they accounted for variability by calculating "relative abundance" for both butterflies and milkweed. They divided the number of milkweed and monarch specimens collected each year by the total number of vascular plant and moth and butterfly specimens collected within the same geographic range. If total collection was down for all specimens, as it was during World War II, then the number of milkweed and monarchs specimens would still reflect their abundance, not a lull in collection. "There's not a lot of cookie cutter methodology to use with these kinds of data," Boyle said. "I think that's mostly just because they're new. As the scientific community starts playing with these datasets more, I think we're going to be able to do more and more compelling kinds of research." Boyle explained that the team's key finding is there is still much more research to do. While GMOs may not be the main culprit, monarchs are still dying off at a disturbing rate. Over the past 25 years, the migratory population of the monarch has experienced a drastic decline, as much as 80 percent, the paper states. "I think the main takeaway from this paper is if we really want to understand why milkweed is declining and why the monarch is declining, we need to figure out what is going on with that other 80 percent not explained by our model," Puzey said. "What is causing this massive variation is simply not explained by these agricultural parameters."